It is 8 p.m. on Friday when the family finishes dinner, and now everyone wants to go get a sweet treat. The family decides they want to go someplace fun for frozen yogurt, where everyone can get exactly what they want. Sweet Frog Premium Frozen Yogurt Shop is a delicious option for quality frozen yogurt at a reasonable price. Located on Hilton Head Island in Park Plaza outside of Sea Pines, Sweet Frog strives to give diners the best frozen yogurt experience through quality yogurt, excellent customer service and an array of frozen yogurt flavors and topping choices. Within the “fro yo” craze, Sweet Frog is a fun self-serve frozen yogurt bar, where patrons select their flavor(s) of yogurt then pick their toppings and pay by the ounce. Sweet Frog Premier Frozen Yogurt Shop has 16 available flavors and over 60 fresh toppings in their toppings bar, including fresh fruit, nuts, candy, sauces and even cake. They are constantly rotating delicious yogurt flavors throughout the shop so diners are almost always guaranteed to find a new taste combination to try. Yogurt flavors that are always on hand are favorites such as Cookies and Cream, Vanilla, Chocolate, and Original Tart, which is a special recipe unique to Sweet Frog. In fact, many people go to Sweet Frog specifically for the Original Tart flavor. The yogurt is also kosher certified with live and active cultures. This tasty sweet shop furthers their first-rate customer service by being accommodating to people with allergies. Sweet Frog offers dairy-free and gluten-free yogurt and topping options. They will also bring toppings from the back and serve them straight from the box for patrons with nut allergies to avoid cross-contamination at the toppings bar. The yogurt shop has been open at this Park Plaza location for two years. It is clean, decorated with bright colors and even has fun frog merchandise available for purchase. The F.R.O.G. in Sweet Frog stands for Fully Rely On God. This franchise is one of the first frozen yogurt concepts to venture to the East Coast when self-serve “fro yo” shops became popular and were predominantly located on the West Coast. The hot summer months have adults and children alike craving a delicious, cold treat. When these cravings strike, why not head out to Sweet Frog Premium Frozen Yogurt Shop, located next to Mellow Mushroom outside of Sea Pines, for countless combinations of yogurt desserts? Have a large party? No problem! 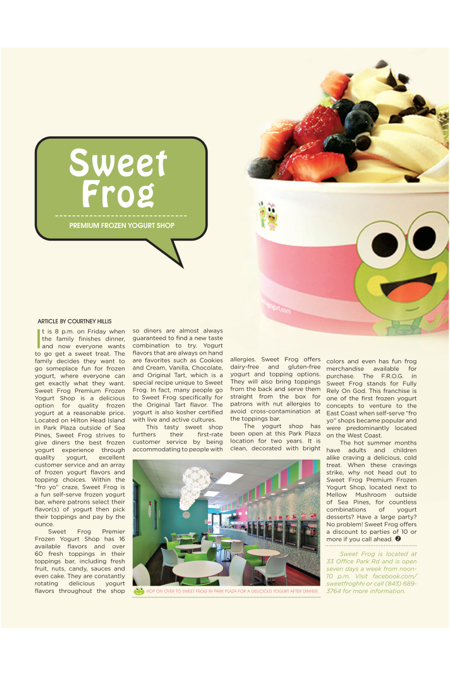 Sweet Frog offers a discount to parties of 10 or more if you call ahead. and is open seven days a week from noon-10 p.m.
Visit facebook.com/sweetfroghhi or call (843) 689-3764 for more information.